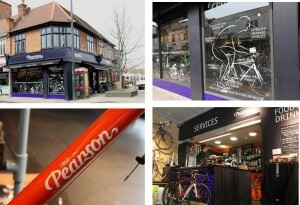 Pearson’s bike shop has a unique claim to fame …… it’s part of the oldest bike shop in the world, as recorded in the Guinness Book of Records! The business was founded in Sutton way back in 1860 and has been run by the same family for the past five generations. 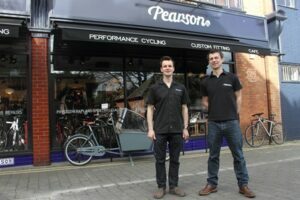 “Our shop in Sheen, which we opened 18 months ago, is our first second shop in all those years,” said William Pearson, who works with his brother Guy. Their expansion reflects the huge boom in cycling in the past five years with thousands more people commuting to work on two wheels or cycling as a hobby in the evenings and weekends. Sheen is lucky to have this unique brand – Pearson’s began making their own bikes in 1906 – as part of its community. There is nothing William and Guy don’t know about bikes and they have turned their Sheen shop into a welcoming and exciting Mecca for enthusiasts and beginners alike. The large premises entice the eye with gleaming racing machines ranging in price from £700 to £8,000 backed up with all kinds of kit and clothing. There’s a service department and a coffee bar. “We want to engage with our customers and have created an environment where they can just drop in for a coffee and a chat at any time,” added William. The brothers and their staff run their own cycle club with evening and weekend rides for anyone who loves cycling or just wants to get fit. It already has over 120 members of all ages and abilities. 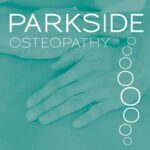 The highlight of the year is Pearsons’ annual sportive of 150 or 75 kilometres which last year attracted 750 riders and raises funds for cancer research at the Royal Marsden Hospital. Upstairs at the shop is something for the real enthusiast – a full cycle fitting service to mold rider and his machine together in perfect harmony. This is achieved using specialised equipment over a two-three hour session during which a rider’s sitting position and leg action is analysed to find optimum comfort and maximum efficiency. The service costs £195 for a full session, or £105 for a basic fitting. 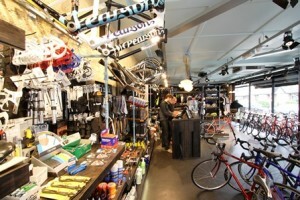 The brothers regularly commute between their two shops – usually on their bikes of course. Guy was a national cyclo-cross champion as a teenager. Both are now married with families, but William reckons he cycles 100 miles most weeks. Bikes with pedigree like a Pearson are not cheap – they are currently building one with a titanium frame and electronic gear-changing which will set someone back a cool £12,000.